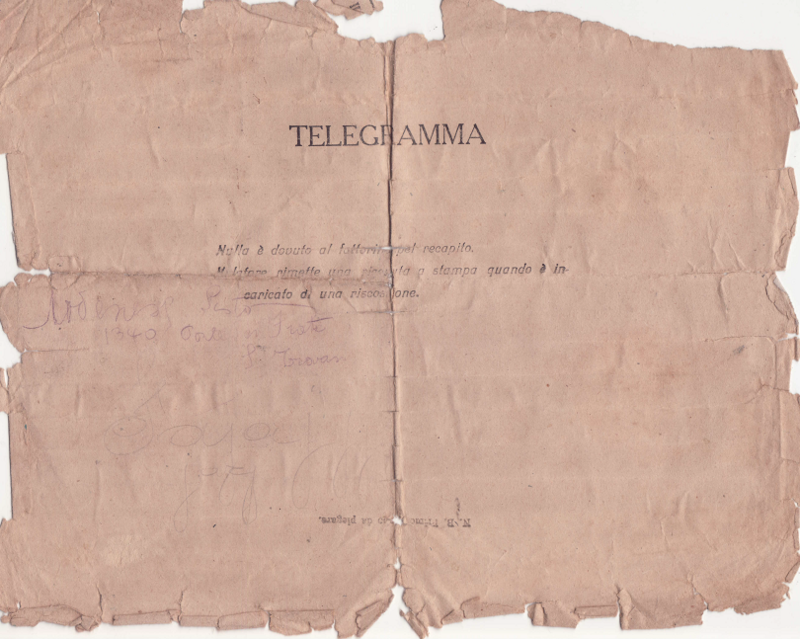 Does this sheet contain the key that was used to encrypt the telegram? Probably not. According to Paolo, the notes on the sheet look like a reshuffled Baudot code. Only the digits from 1 to 5 are used. 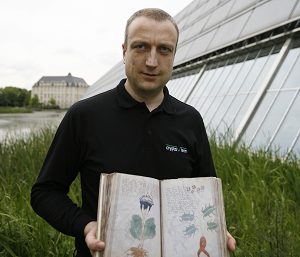 So, Paolo believes that the two documents have nothing to do with each other. The telegram consists of codegroups of 2 to 5 digits each. 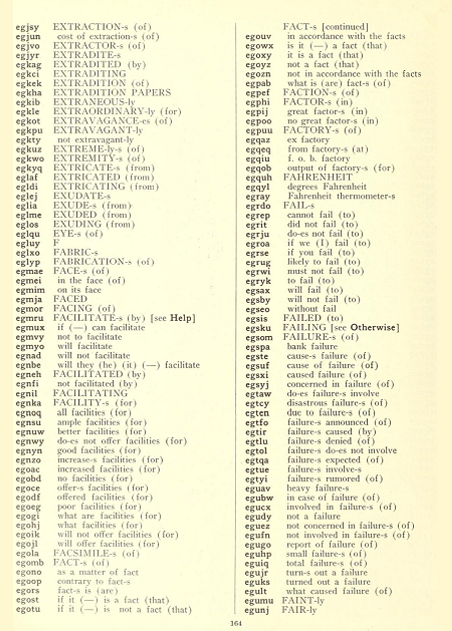 There are 176 different codegroups altogether, 114 of which appear only once. Most codegroups are ordered some way; for instance the most frequent codegroup is 8765, the second is 7654. Is this a mnemonic feature? 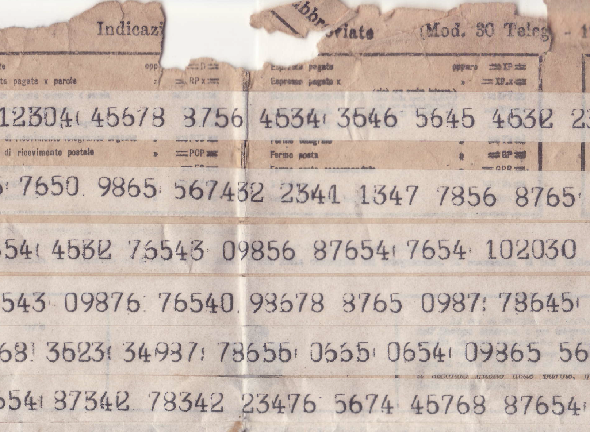 The telegram was probably encrypted with a code. 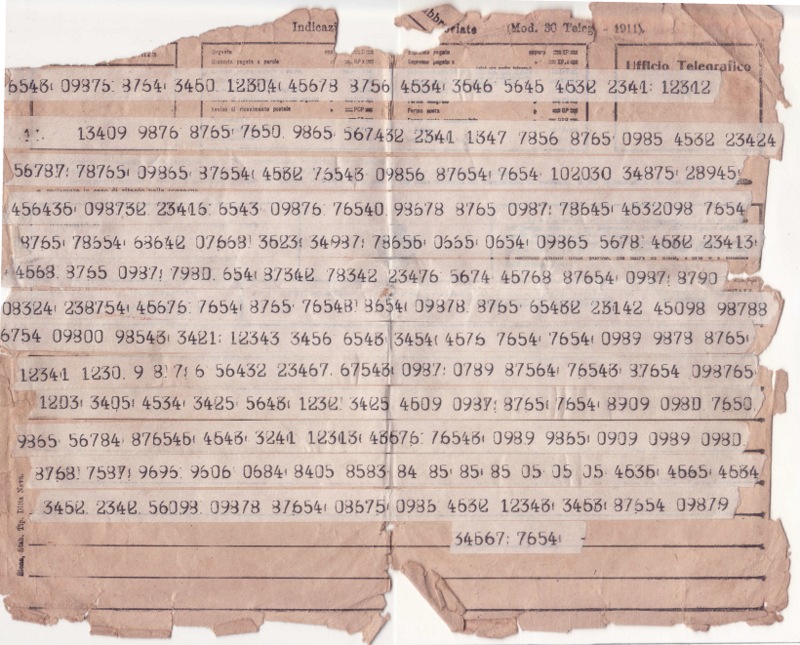 If so, the only realistic way to solve it is to find the codebook that was used (the one shown below is certainly not the correct one). Even worse, in addition to the code, a second encryption step might have been applied. Can a reader solve this mystery? 1) Why the leading zeros on some of the codes? 2) Many codes have digits which are “in sequence”, at least partially, for example: 45676 or 12343 or 12341. Too much to be a coincidence? 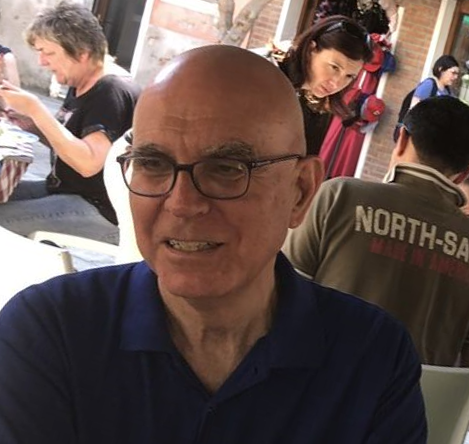 @Klaus: Did Paolo Bonavoglia try out the “Cifrario Mengarini” and look for a matching codebook in Filippo Sinagra’s collection? Another observation is that there are seven two-figure groups in the message, all adjacent to each other. There are four one-figure groups, also adjacent to each other. I have no idea if this is significant or not. 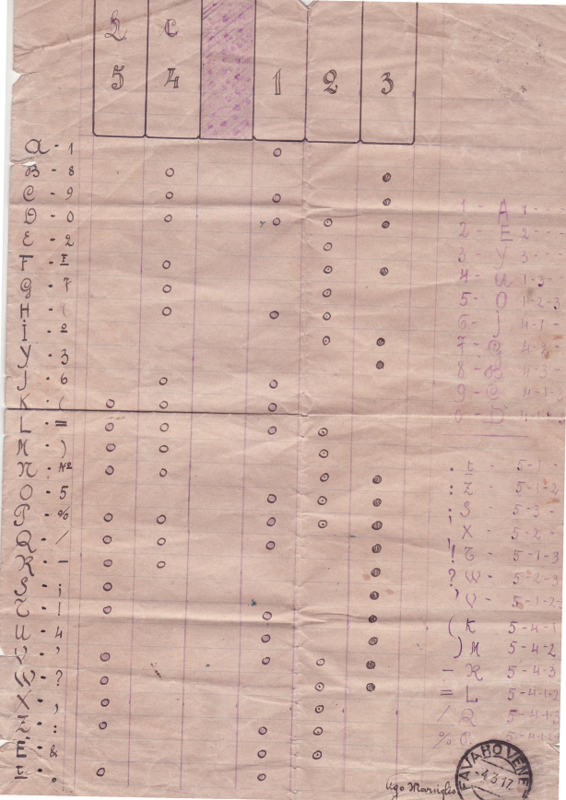 > According to Paolo, the notes on the sheet look like a reshuffled Baudot code. > Only the digits from 1 to 5 are used. 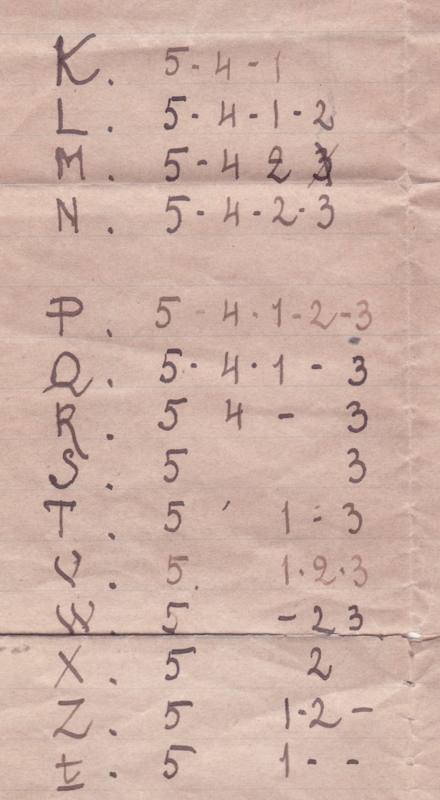 The rear side (showing combinations involving the digits from 1 to 5) just shows a re-statement of the code on the front.